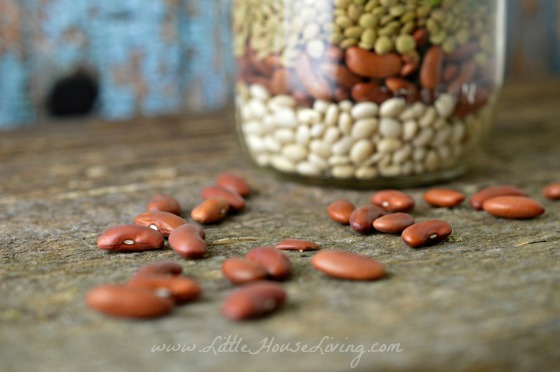 Beans are a great way to stretch your grocery dollars, especially this time of year when it seems like everyone is tightening their belts a little more. 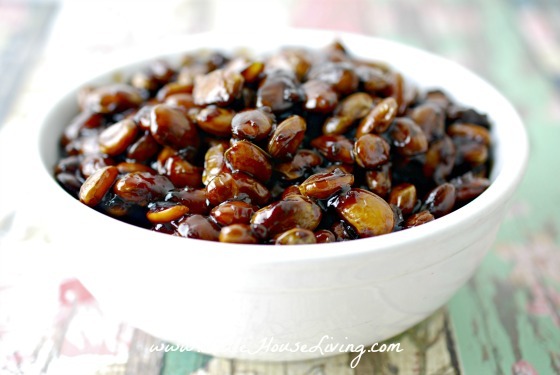 We love dried beans in our home and try to have at least one (if not more) bean meals each week. 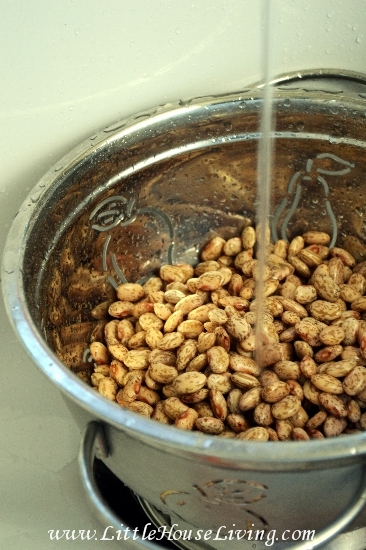 First things first….if you haven’t yet learned how to soak and cook dried beans, you will want to start by reading this article. 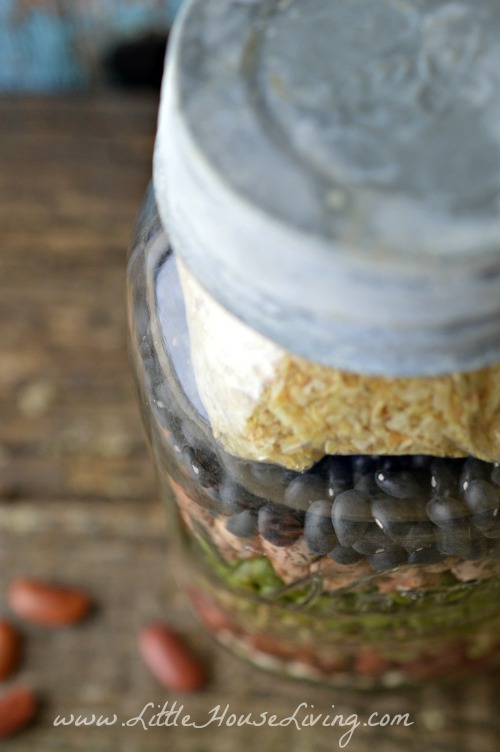 Dried beans are a good frugal staple but can take a little bit more time to make. 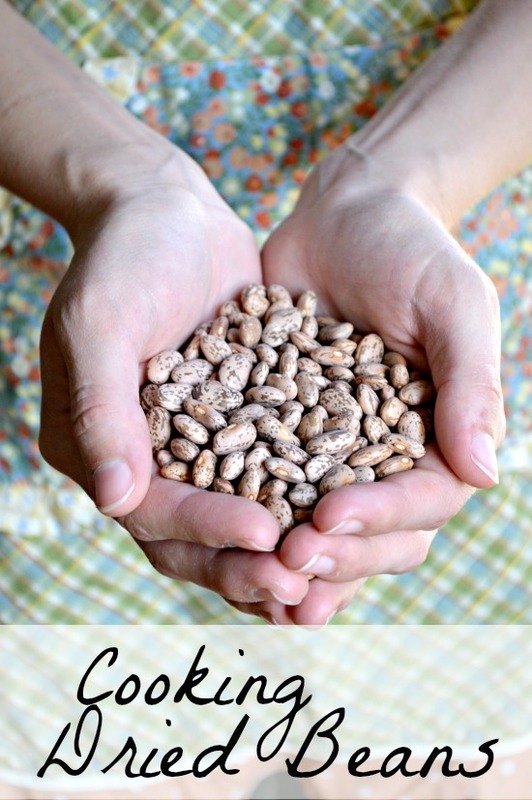 You can always make your own Canned Beans or Canned Pinto Beans for an easy way to make faster meals. Bean flour is another good way to add protein and fiber into your diet without even realizing it. 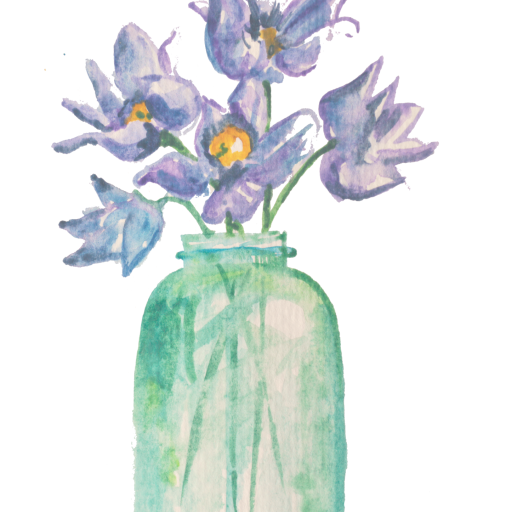 Here’s how to make your own bean flour and here are 2 recipes that use bean flour. 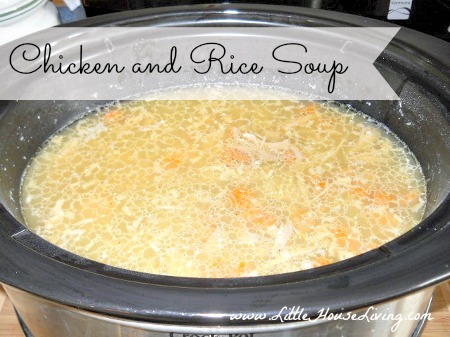 Cheeseburger Soup and Chicken and Rice Soup. Refried Beans can be great for so many different side dishes or meals! Here’s how to make a simplified version of Refried Beans and Easy Refried Black Beans. This Dried Bean Soup Mix is a great frugal dried bean meal that you can put together ahead of time and store in your pantry until you need it. It’s always a great meal to enjoy on a cold evening! 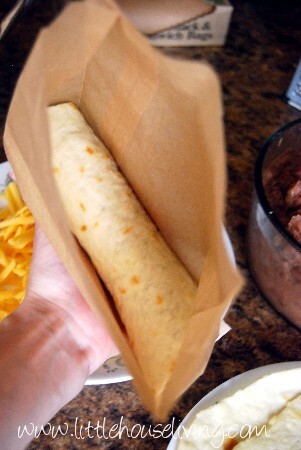 Beef and Bean Burritos are another great meal that you can make in advance with those frugal beans. These are great for a quick lunch or a supper on the go. 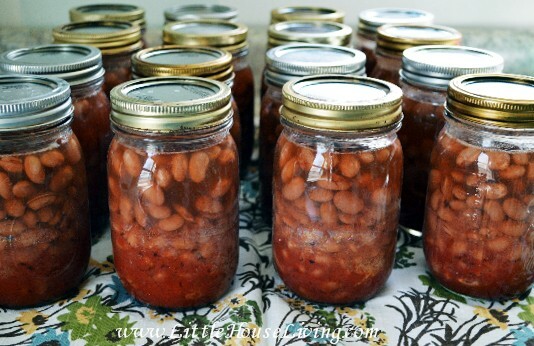 Old Fashioned Baked Beans are more of a side dish but still a delicious one at that! 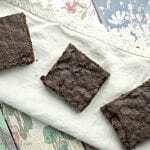 You can make these on the stove top or in the slow cooker. Here are even more great bean recipe ideas from our readers on our Facebook page. Great white northern or navy beans. Soak overnight. Next morning, rinse off beans. 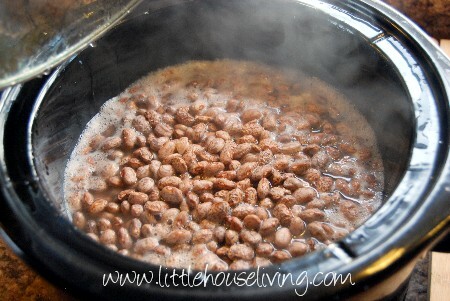 Put beans in a large pot and cover beans with water, but on a low boil with lid. In a separate pot, put enough chicken broth to cover some peeled and diced potatoes. Bring broth to a med boil, and toss in some heavy noodles, or dough noodles, broken into small pieces. Salt the beans to taste, drain off water until there’s just enough to cover the beans. When potatoes are done, dump the whole pot of potatoes, noodles and chicken both in with the beans. Let simmer until beans are as tender as you like. 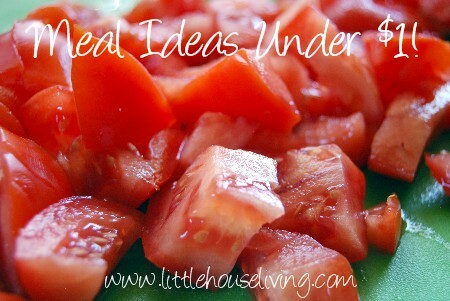 You can add diced ham if you like. I serve this soup with raw onions and buttered cornbread. – Jane K.
Variety of dried beans plus a meat, onions, peppers, paprika, garlic…all added to the crock pot with broth or water. Pile this on rice and a winter delight. – Susan P.
Garbanzo beans, soak over night, drain. Toss in olive oil, garlic salt, parmesan cheese. Roast until golden brown. Yummy and crunchy. 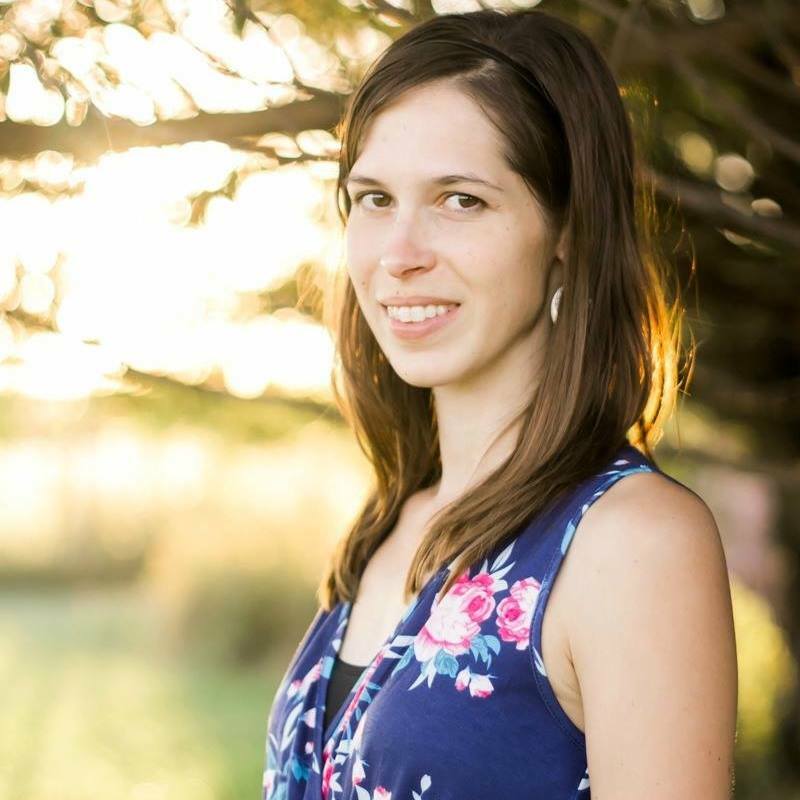 – Leanne W.
Peasant soup. Northern beans cooked with salt and pepper, a bay leaf, and a tiny pinch of crushed red pepper flakes. Serve in a bowl (sprinkled with cheddar cheese if you have it) with cornbread and fresh green onions, tomato and cucumber slices on the side. – Doni C.
PINTO BEAN FUDGE 1 C smashed pinto beans ! T vanilla 8 C powdered sugar 3/4 C melted butter 1C coco powder. Melt butter mix in coco mix beans and vanilla into coco powder and smashed pintos Mix will be stiff add powdered sugar less sugar the denser the fudge press into a 9×13 glass pan or 8×8 refrigerate until ready. You can sprinkle/press walnuts or pecans in and use large grains of kosher salt litely before serving. Yummy! – Jo Dee B. 8oz of cooked black beans, 1 medium long zucchini or 2 small ones, cubed in smaller pieces (Can use any color but green is the best), Some chopped onion, A little minced garlic, 1 jalapeno (spicy or not), Salt and pepper, A little dried oregano, Oil for the pan (enough to coat the pan), Some water (about 1 cup, (Optional 1/2 can of corn). In a skillet heat oil on medium high (7). Throw in zucchini, onion and jalapeno (corn) and saute till soft like. Add in drained cooked beans, garlic and seasonings (S&P) and a little dried oregano. Pour in about a cup of water just enough to cover the food. Cook till almost all the water is soaked up but not all of it. Will not take long, less than 10 mins. Season more if needed. 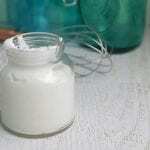 This home made recipe is very versatile so do what you like with it. *This recipe comes from the mountains in Mexico where they cook this outside on a fire but can be cooked indoors on a stove. – Sheri C.
Drunk beans. Start a pot of pintos with a whole chopped onion & several garlic cloves, meanwhile chop & fry up 1 lb of bacon, set aside & then sauté chopped jalapeños & tomatoes in bacon grease, add a pack of chopped Canadian bacon & a pack on chopped hot dogs to veggie mixture & continue to sauté. Add all that to the beans along with one bunch of chopped cilantro & a dark beer (add these towards the end). Season to taste with salt if needed & some dried oregano. Even better when garnished with Mexican cream & dry cheese (cotija). – GD A. 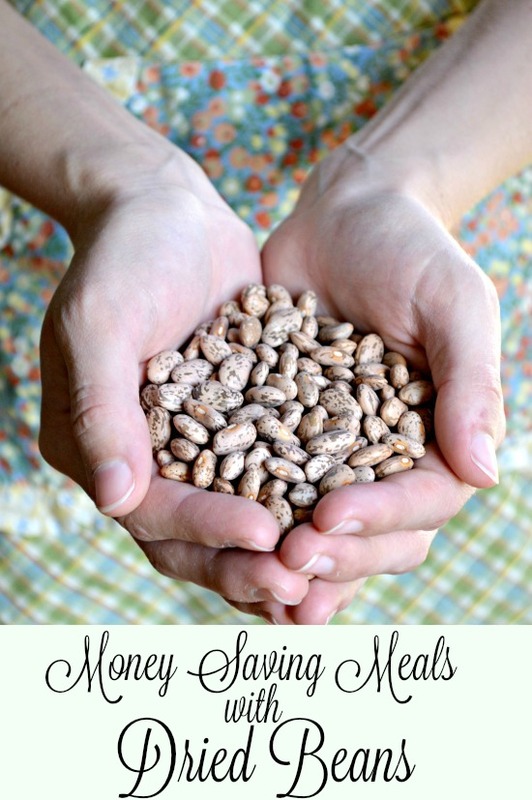 What are your favorite frugal meals with dried beans? Great ideas!! I love beans! To help with that “gassy” problem just cut back a little on the salt and add 1-2 t. of baking soda. works great and no tummy ache. Thanks for some great tips! I am actually making a pot of beans today, in memory of my dad, who used to make the best pot of beans. He’s been gone 4 years today. Anyway, I’m so glad I read this because I have gotten to the point of really not liking canned beans. They always taste funny to me! So, I honestly had not thought about canning my own. I sometimes freeze a small portion to use as refried, later on. I got your book and read it in my kitchen while cooking.